Senators gave first-round approval March 26 to a bill that was amended to include several bills related to natural resources, including a provision that would allow public power utilities to withhold information that could give competitors an advantage. 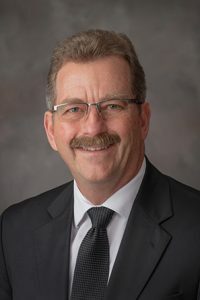 As introduced by Brainard Sen. Bruce Bostelman, LB1008 would increase the amounts of liquidated damages for a person who illegally sells, purchases, takes or possesses certain wildlife. • wild turkeys from $100 to $500. A Natural Resources Committee amendment, adopted 38-4, added provisions of four other bills heard by the committee this session. 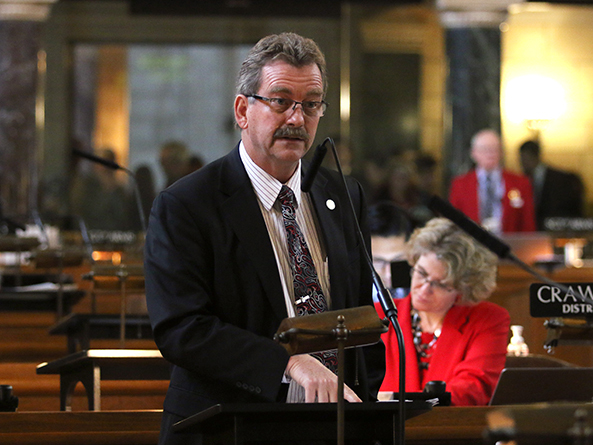 LB713, introduced by Sen. Steve Erdman of Bayard, would increase compensation of those serving on the Nebraska Oil and Gas Conservation Commission, which regulates the oil and natural gas exploration and production industry in the state. As amended by the committee, it would raise the per diem for commissioners from $50 to $400 and would increase the annual compensation cap from $2,000 to $4,000. LB820, introduced by Venango Sen. Dan Hughes, would authorize the Nebraska Power Review Board to assess a $500 fine on a private electric supplier that begins construction on a renewable energy generation facility less than 30 days before notifying the board of its intent. LB762, also sponsored by Hughes, would extend the sunset date for the state’s scrap tire grant program from 2019 to 2024. The amendment also includes LB822, which the committee replaced with an amendment that would authorize the public power industry and the Nebraska Power Review Board to withhold competitive or proprietary information that would give an advantage to business competitors. Hughes introduced the amendment, which received a public hearing on March 7, in response to a Nebraska Supreme Court opinion from Feb. 23. The justices reversed a Platte County District Court’s decision that would have allowed the Nebraska Public Power District to withhold proprietary information from a potential competitor that had requested documents showing cost and revenue information for each of NPPD’s generation facilities. The Supreme Court wrote that, in order to withhold the information, NPPD had to show that releasing it would give an advantage to competitors and serve no public interest. It overturned the lower court’s decision because NPPD did not prove the second element of that two-pronged test. Both courts interpreted relevant public records statutes differently, Hughes said, and both speculated on the Legislature’s intent. He said the Supreme Court has indicated the Legislature should clarify whether it wants the public power industry to provide private competitors with information they would need to underbid public utilities in the Southwest Power Pool, a group of utilities and power generation companies that oversees electricity infrastructure in Nebraska and 13 other states. Hughes said the amendment would allow utilities to protect information that could give competitors an advantage while ensuring that the public would have access to a utility’s other records. Sen. Tom Brewer of Gordon opposed the public power provision. Brewer said he has not received information he requested from NPPD regarding its planned R-Project, a 225-mile high-voltage transmission line that will be routed in part through the Sandhills region. Brewer filed an amendment that would prohibit the construction of wind energy projects in counties that have not adopted zoning regulations that address a project’s impact on property values and the environment, among other factors. Sen. Jim Smith of Papillion supported the committee amendment. Without it, he said, the Supreme Court’s ruling would require the state’s public power utilities to release proprietary information to private competitors, which would ultimately hurt ratepayers. “This is a common-sense fix to keep the playing field level for public utilities and investor-owned utilities,” he said. Sen. Matt Williams of Gothenburg agreed, saying that the state would never require a private company or nonprofit to divulge its business secrets. He opposed Brewer’s amendment, which he said would be a de facto moratorium on wind energy development in counties without specific zoning regulations. “I don’t think there’s any place in this for the state telling counties what they have to do,” Williams said. Sen. Tyson Larson of O’Neill opposed the portion of the committee amendment dealing with public power. He acknowledged that certain information—such as a contract between a public utility and a private company—should be confidential, but he said public utilities’ generation costs should be available to ratepayers. Hughes filed a motion to invoke cloture, or cease debate and vote on the bill. The motion succeeded 35-4. Thirty-three votes were needed. The Brewer amendment failed on a vote of 8-28. Senators then voted 42-2 to advance the bill to select file.